PRIVATE sector economists have downgraded their full-year forecasts for the local economy in response to a lacklustre showing by the nation's factories. 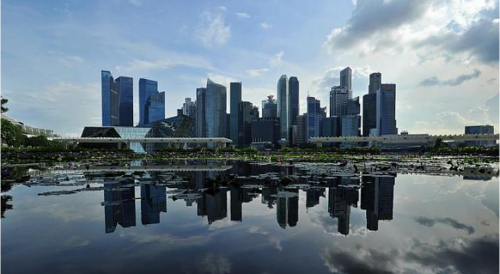 Economists' predictions for Singapore's overall growth are down a little but they now expect the service and construction sectors to take up the slack from manufacturing, according to a new survey released yesterday. They expect manufacturing output to grow just 0.5 per cent from last year, significantly lower than an earlier estimate of 1.8 per cent, the quarterly survey by the Monetary Authority of Singapore (MAS) showed. The poll, sent out on May 26, reflects views received from 27 analysts who closely monitor the Singapore economy. The economists surveyed expect the overall economy to expand 2.7 per cent this year, down marginally from an earlier forecast of 2.8 per cent. Official forecasts tip growth of between 2 per cent and 4 per cent for this year. DBS economist Irvin Seah, who expects economic growth to come in at 3.2 per cent this year, said much of this expansion will be driven by the service and construction sectors. "Manufacturers are being weighed down by ongoing restructuring and rising costs, and regional players are also nipping at our heels." UOB economist Francis Tan, however, said the sector is turning around after a dismal 2.7 per cent first-quarter contraction. "The first quarter was a surprise, but I think the worst is over for this year," said Mr Tan, who expects factory output growth to pick up in the second half given a low base last year. Economists' estimates for growth in some service sectors and the construction industry have been revised upwards in the latest survey compared with an earlier one in March. While the tepid property market has weighed on the construction sector, large-scale infrastructure projects such as the new airport terminals are set to have a significant positive impact which analysts might previously have underestimated, Mr Seah noted. Still, "respondents remain concerned about uncertainties in the global environment", he said. Barclays economist Leong Wai Ho, however, noted signs that the world economy will pick up in the second half of the year. "The first five months of the year were slower for most countries... This was due in part to currency volatility which limited their ability to consume imports. "This took a toll on us and many other Asian exporters." Mr Leong, who expects the Singapore economy to grow 3.4 per cent this year, said there are "hopeful signs" that the United States and Europe will "reassert themselves in the world economy" from the third quarter. Besides strong demand for Singapore's exports, this also means trade-related sectors such as wholesale and retail trade are likely to pick up pace. Survey respondents expect consumer prices across the economy to remain unchanged compared with last year. Their forecast for full-year inflation dipped slightly to 0 per cent, from an earlier estimate of 0.1 per cent. The respondents also expect MAS core inflation - seen as a better gauge of out-of- pocket expenses for households - to be 1 per cent, unchanged from the previous survey.